Hinrich Woebcken, addressing employees, will assume the role as president and CEO of Volkswagen Group of America. WASHINGTON -- The Volkswagen brand’s recently appointed North America chief, Hinrich Woebcken, has been named CEO of the VW Group of America. Woebcken, 55, had been the group’s interim chief executive since the abrupt departure of former chief and dealer favorite Michael Horn on March 9. Woebcken will continue in his dual role as CEO of the VW brand’s North America Region, which he has held since January. Woebcken’s appointment was announced Friday during an employee town hall meeting at VW’s U.S. headquarters in Herndon, Virginia, the company said in a statement. 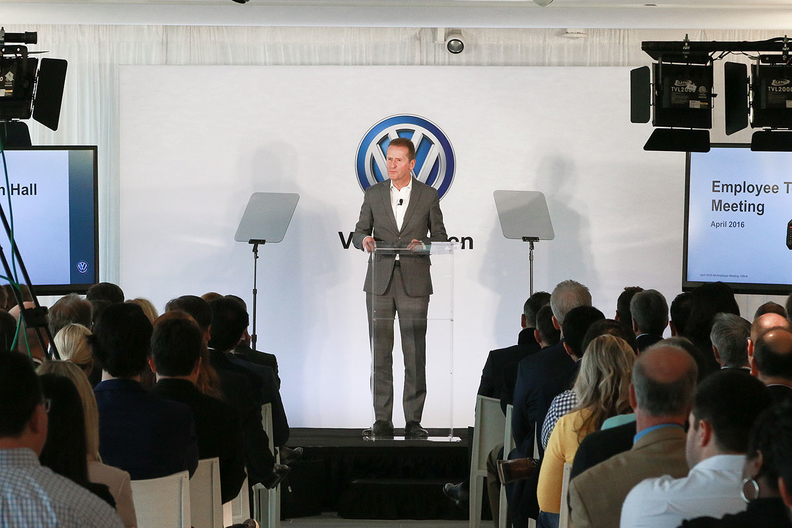 According to VW, Woebcken and global VW brand chief Herbert Diess explained to VW’s U.S. employees at the town hall how aligning VW’s sales and marketing, product development, procurement and production operations in North America would strengthen the beleaguered brand’s presence here. The VW’s brand’s U.S. sales have slipped 13 percent this year and have dropped in five out of the last seven months since the company’s diesel emissions violations were disclosed in late September. VW formed the North America region in September as part of its response to the diesel emissions cheating scandal. The move was part of an ongoing effort to decentralize operations and push more responsibility for the VW brand’s operations to various regions, a process accelerated by the emissions crisis. 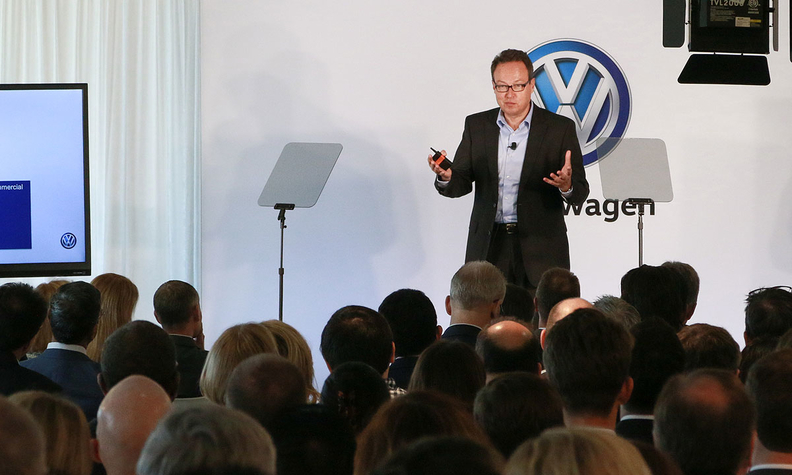 Herbert Diess, CEO of the Volkswagen brand, addresses employees in Virginia on Friday. VW initially appointed the former head of Czech brand Skoda, Winfried Vahland, to the top role in North America, but he quit three weeks later, leaving the key post vacant until Woebcken, a 10-year BMW veteran, was tapped for the job in January. “With the new structure of the North American Region we will be empowered to make the decisions to bring the vehicles that the consumers in the market are demanding,” Woebcken said in a statement.